Jimi’s on the play, and leads with an Akoum Refuge, putting her up a life at the outset, while I play a Swamp. Next turn, she adds a Mountain- then taps out for a Goblin Arsonist and Scorched Rusalka. I play a Plains and pass. Now turn 3, Jimi swings for first blood with both beaters before following up with an Ashmouth Hound. For my part, I play a Lingering Souls to get my first creatures into play, 1/1 Spirit tokens. Undeterred, Jimi sends in her Hound and Arsonist for 3, then adds a Reassembling Skeleton. Back to me, I summon a Phantom General to make my Spirits 2/2’s, but Jimi responds by popping her Arsonist to the Rusalka in response. This lets her throw a point of damage my way but, more importantly, throw the one from the Arsonist at a Spirit token before the General’s buff takes hold. I attack in the air with my remaining Spirit to leave Jimi at 19, and end the turn. Now turn 5, Jimi solves the General with a lethal Devil’s Play, then attacks with the troops for 4. Now at 10 life, I drop a Doomed Traveler and Twilight Drover, looking to buy some time to stabilise. Back to Jimi, she sends in the Hound and Skeleton for 3. I block the Hound with the Doomed Traveler, which dies to the Hound’s early damage and fails to trade. Still, it gets me a Spirit token and saves some damage, so it’s no loss. I retaliate with a Spirit in the air for 1, which allows me to play my Duskhunter Bat with bloodthirst. A turn-7 Skirsdag Cultist ups the stakes, as Jimi can now throw some damage around the table. The Hound comes in for 2 more, forcing me to block with a Spirit. It dies, but I do get to put a counter on the Drover as a result. At the end of turn, I then basic landcycle an Absorb Vis for another Swamp. Back to me, I summon a Fiend Hunter to dispatch the Cultist, then attack in the air for 2 with the Bat. At 16 life, Jimi then Terminates the Hunter to get back her Cultist, then sends in the Hound and Skeleton for another 3. I chump the Hound with the remaining Spirit token, giving a second +1/+1 counter to the Drover, then kill the Cultist for good with an Urge to Feed at the end of the turn. Back to me, I counterattack for 2 more to leave Jimi at 14, then deploy a Sengir Vampire. Now turn 9, Jimi sees my Vampire and raises me a Gang of Devils. Over to me, I send in the Bat and Vampire for 6, dropping Jimi to 8 before following up with a Vampire Lacerator for blocking detail. Jimi then goes all in with her army, swinging with the side for 7. Not wanting to kill the Devils I chump it with the Lacerator, pull off +1/+1 token from the Drover to make a pair of Spirits to trade out with the Rusalka and Skeleton, and then offer the Drover in trade for the Hound. Everything dies except Jimi’s Gang, and she’s not denied for long. A Bump in the Night followed by a 3-point Devil’s Play leave me at death’s door with 2 life. I play out my turn, dutifully sending in the air force to even up the score… but I fall short. Jimi’s flashback Bump has me beat, and I concede. On the play, I lead with a Doomed Traveler, while Jimi follows with the Goblin Arsonist. Next turn, I add a Swamp and pass. Jimi attacks for 1 with the Arsonist, and I block with the Traveler for the trade. Jimi pings me for the 1, while I get a replacement Spirit token. Jimi then brings out a Reassembling Skeleton and passes, though at the end of the turn, I basic landcycle an Absorb Vis for another Swamp. Now turn 3, I bring out the Twilight Drover and pass, while Jimi’s turn is a blank- missing even the land drop. Back to me, I stick a Mark of the Vampire on the Spirit token and send it in on the attack for 3. That puts Jimi at 17, and me back up to 22 thanks to the lifelink. Jimi counterattacks with the Skeleton for 1. The Drover and Spirit carve off another 4 points of damage on turn 5, putting me up to 24. That lets be bloodthirst a Duskhunter Bat as I threaten to run away with the game. Jimi finally finds her third land drop, and uses it to deploy a Vithian Stinger– a nettlesome pest against Sorin’s deck. A Sorin’s Thirst sees it off the battlefield next turn, after which I hammer in with my air force for another 5 damage. My lead now looks unassailable, with Jimi at 8 and me at 26. Back to her, she brings out a Coal Stoker, then uses its free mana to fuel a Browbeat (I take the damage). Now turn 7, I send her to 2 with another attack. She plays a Hellrider for the fun of it, then concedes- the stumble was too much to recover from. For the last game of the match, Jimi starts will with a Goblin Arsonist, then attacks for 4 next turn behind it and a Hellspark Elemental. My first play is an answering Mesmeric Fiend, and I pluck away a Skirsdag Cultist from her hand. Next turn, though, Jimi shocks with another Elemental, dropping me to 12. I play a Tainted Field, then attack with the Fiend for 1 before playing Lingering Souls. Now turn 4, an Akoum Refuge restores Jimi to full health, after which she plays a Vithian Stinger and attacks for 1 with the Goblin. I kill the Stinger with an Urge to Feed, then counterattack with the Spirits and Fiend. I then flashback the Lingering Souls for two more Spirits and pass the turn. Back to Jimi, she next unearths both Elementals to slam into me for 7, and suddenly I’m well within burn range at 4 life. Down but not out, a Phantom General lets me counterstrike for a similarly brutal amount of damage, and Jimi’s cut in half to 8. A turn-6 Sulfuric Vortex puts the game on a short timer, after which she Flame Slashes the General to neuter my offense. Her only creature is the Goblin Arsonist, and she attacks with it for 1 before ending the turn. Back to me, I immediately lose 2 on my upkeep from the Vortex. I drag Jimi down to level with an attack, but have to concede the game- one turn away from an Absorb Vis. ALthough this match wasn’t quite as narrow as our first set of three where I piloted Tibalt, I was happy to see what they weren’t far wide of the mark. Indeed, aside from game two, where Jimi missed some critical land drops, the games once again felt neck and neck much of the way through. Present too was the cut-and-thrust feeling where each deck had small trumps over the other. In this case, I noticed a new and frustrating angle where my Edict effects (Gatekeeper of Malakir, Butcher of Malakir) were happily neutralised by her Reassembling Skeleton. Overall from Sorin’s seat I had nearly as much fun this time around. That said, while the overall effect of Sorin’s deck was that of a construction that managed to hold its own against its rival, it did seem a bit like the second sibling when it came to comparing the two in terms of intricacy. That’s not necessarily a bad thing, however, as Sorin’s deck seemed much less inclined to the sort of inconsistency that could send poor Tibalt easily off the rails. In the initial review of the deck, we noted the deck’s two strategies consisted of creature token generation, and life/death manipulation. These twin tactis seemed represented in equal measure, and here Sorin did not disappoint. I was consistently able to bring Spirit tokens on-line, and despite their small size they were able to be a potent threat thanks to the supportng suite of cards like the Phantom General and Mark of the Vampire. With Tibalt lacking an aerial presence, this was another incidence of point/counterpoint that really highlighted the contrast between them. Having now played both decks out, Jimi and I both are of a mind that this has been the best Duel Decks release to date. Naturally that’s a subjective judgment and your mileage may vary, but the attendion to detail and intricacy of design stands Duel Decks: Sorin vs Tibalt in good stead, and continue to bode well for the product line. Misses: As with Tibalt’s deck, we struggle to answer this, as weaknesses tend to be part of the overall balance of the deck. Removal’s a bit sporadic and inconsistent, but what do you expect from a largely-singleton Duel Deck? 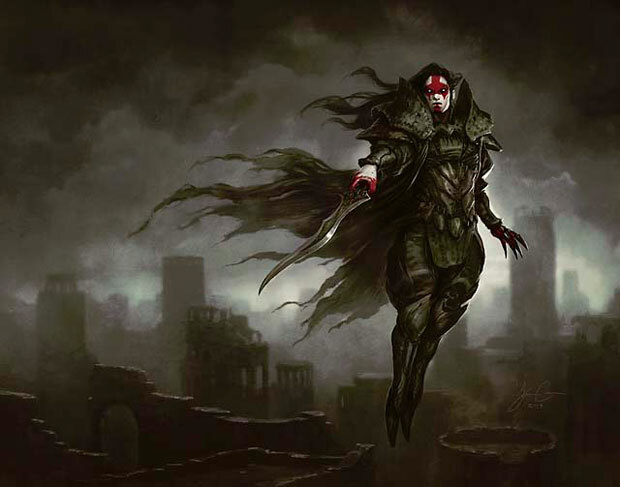 1 card fits the theme of the deck and uses the token generation it’s capable of but is absent: Blade of the Bloodchief. I agree, blade of the blood chief would have been great, as would bloodghasts, but sacrificing is not exactly this deck’s theme. I think the blade still would have been good, as a counterpoint against Tibalt’s unearth, plus emphasizes vampires while not useless without it. Then again vexing devil would have been great in Tibalt’s deck, ah well. I love how these decks play against each other. Tibalt’s deck is a lot of fun to play, Sorin’s a little more consistent. Results vary with both, but you’ll have fun either way. Why did they not include an Emblem for Sorin? Why? I’ll never understand why they throw in some tokens and not others. Why they include Emblems for VvK, but not SvT. It’s not like they’re not printing quite a few of these. It’s more of an annoyance than anything. No problem going on magiccards.info and printing me out what I need. Not going to spend $2 or more some sites want for these. Talking tokens and emblems here, not Genesis Waves. They only have so much space. Notice how they package one Spirit with one deck and one with the other: keeping the decks “equal” in cards makes the packaging work. They just simply can’t include too many extra tokens.